also the fact that, after forgotten silver, he already owns the title of 'april fools king of the world' should be reason for him to not even try anymore. but dammit, he just keeps on givin. And, Peter Jackson is always grumpy, she says. Guess that's just the stress. the hurling dinosaurs is the basic illustration they've been displaying since day one. and damn, Peter's lost weight! Frank Darabont looks like Brian Rooker, or whatever the really lame director guy is named in Mulholland Drive, you know the one. not justin theroux. the guy in the office rehearsal who looks likes Frank Darabont. 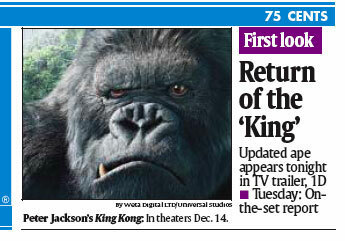 NBC and Universal announced today that the first trailer for Peter Jackson's King Kong will debut simultaneously on all nine of the NBC Universal conglomerate's TV networks. In the announcement, Universal Pictures Chairman Stacey Snider gushed about the film, "'King Kong, as it's being interpreted by Peter Jackson, is the work of a master storyteller operating at the full height of his creative powers. We are immensely excited to allow the world its first glimpse of this extraordinary film and its remarkable central character with an event that is as ambitious and momentous as King Kong deserves. This roadblock demonstrates just how coordinated and unified a company NBC Universal has become in just over a year, and we are proud of our shared commitment to accomplishing something of this magnitude." Also on June 27th, the Kong teaser will debut online (on the Volkswagen website, oddly enough) and on various personal wireless devices. It'll also be shown in various high-profile locations around the world like the Times Square Jumbotron and giant screens in Universal's theme parks. The preview hits the big screen on June 29th. Next they'll be beaming previews directly into your brain. Kong, which retells the classic story of the great ape captured on a remote exotic isle and brought to '30s New York, stars Naomi Watts, Jack Black, Thomas Kretschmann, Colin Hanks, Andy Serkis, Jamie Bell and Adrien Brody. The film hits theaters around the world on December 14.
hell yeah he has. i didn't watch that production diary, but i just saw him on that George Lucas tribute thing and the mother fucker looked like a cancer patient or sumthin. i wouldn't have even recognized him if his name wasn't at the bottom of the screen.